Looking to make a statement early in the Southland Conference season against Texas A&M-Corpus Christi, the Privateers (7-6, 2-0) did so in nerve-wracking fashion, securing a 73-72 overtime victory at Lakefront Arena. Nate Frye, who notched a career-high 27 points to go along with 9 rebounds, led the way for New Orleans. His driving layup put UNO ahead 61-59 with four seconds left in regulation, but TAMU-CC's Ehad Amin went coast-to-coast for an uncontested driving layup of his own to tie the game at the buzzer and send the game to overtime. Amin, who led TAMU-CC with 25 points, led an Islanders comeback from a nine-point halftime deficit, but his running one-hander, which would have won the game in overtime, missed at the buzzer. 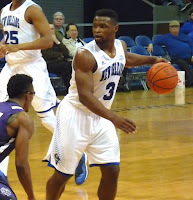 Preseason Southland first teamer Rashawn Thomas, a longtime UNO tormenter, added 23, 19 of which came after halftime. New Orleans also got 17 points apiece from seniors Erik Thomas and Christavious Gill. New Orleans travels to Lamar on Thursday for its first conference road game of the year.